In March 2006, the Faculty of Education at Memorial University was awarded a research grant from the Social Sciences and Humanities Research Council of Canada (SSHRC), through the Community-University Research Alliance (CURA) programme. 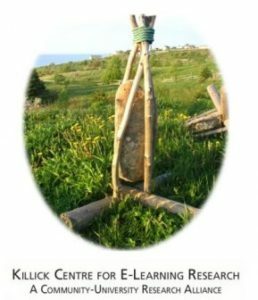 Under the project title “Building Communities in the New Learning Environment,” the research was operationalised with the creation of the Killick Centre for E-Learning Research, with a mission to foster innovative research, training, and generation of new knowledge in the area of e-learning for education, particularly as it relates to isolated rural areas. While the focus is K-12, the importance of the transition years (from secondary to post-secondary education) is also recognized as an essential part of the agenda. The alliance includes 15 co-investigators (i.e., 12 university researchers and 3 partner researchers), 10 community collaborators, and 12 community partner organizations representing all players of the education system in the province of Newfoundland and Labrador. To focus the main research mandate, the Killick Centre consulted with all stakeholders during the project development stage and identified three goals. The Alliance Model required that the partners collaborate during all stages of the research endeavor. In July 2005, initial consultation meetings were held, in which partners and researchers identified critical research topics and explored fundamental research questions. The following chart lists those questions and references the specific research projects that were created to address each question. A major part of the CURA mandate was to “promote sharing of knowledge, resources, and expertise between post-secondary institutions and organizations in the community,” and a major expectation for each CURA project was to include “a knowledge-mobilization component (e.g., workshops, seminars, colloquia, policy manuals and other publications, public lectures, etc.) that met the needs of both academic and community partners. Although the integrity and importance of academic writing was recognized, a plan was developed to ensure that research findings were also communicated in a manner that was relevant and meaningful for the partners. The goal of knowledge mobilization, as stated in a Killick Centre article published in Memorial University’s Gazette, was “to increase community readership, enhance understanding, and decrease the intimidation and mental barriers that often exist when the average person sits to read the results of an academic research study” (Wicks, 2007). Communications, therefore, went beyond publication in academic journals and delivering papers at academic conferences. It included sharing of knowledge through a variety of media and providing opportunities for dialogue, where university and community partners can exchange ideas and generate new knowledge together. A major knowledge mobilization event was the international EDGE 2010 Conference, held in October 2010. With the conference theme “E-learning: the Horizon and Beyond,” this conference attracted presenters, keynote speakers, and participants from all over the world. (1) Comparisons were made of the grades and drop-out rates of students in on-campus and distance education classes in the same course, taught by the same instructor, in the same semester, over an eight-year period. Results showed that, on average, there was no difference in average grades, but there was significant variation. Sometimes they were the same; sometimes on-campus grades were higher; sometimes distance education grades were higher. However, students in distance education were more likely to drop the course. (2) In comparing courses that were taught in distance education and on-campus formats by the same instructor, in the same semester, over the eight-year period, no consistent trends or patterns indicated that distance education was or was not more effective than on-campus, or that the format of the distance education course (i.e., correspondence vs. multimedia vs. discussion) made a difference. (3) If students were more likely to drop out of distance education classes, was it because they were less engaged? In examining registration records of university students over a two-year period and their engagement in their distance education courses, it appeared that dropping out was most likely to occur at the beginning of the course. The level of engagement did not seem to be a factor. (4) In mathematics, could online software increase students’ level of mathematical intimacy? Results indicated that while there were no differences in general mathematical intimacies between the two groups, students’ levels of mathematical intimacy within the online software context showed that they either loved it or hated it. (5) Using data provided by the Department of Education, the chemistry and physics achievement of students who took distance education was compared with those who received classroom instruction. Sheppard (2009) found that rural students, in both classroom and distance education, achieved similar results to urban students in grade 11 and grade 12 chemistry. Sheppard also found that while rural students in both classroom and distance education did as well as urban students in grade 11 physics, rural students receiving classroom instruction did not do as well as their urban counterparts in grade 12 physics. However, rural students taking grade 12 physics by distance education did achieve as well as students in urban schools. (6) Seifert and Sheppard (2009) analyzed mathematics scores for students who took grade 11 advanced mathematics followed by grade 12 pre-calculus by either distance education or classroom instruction. The results showed that while urban students receiving classroom instruction did better than rural students completing the grade 11 mathematics course by distance, the scores of urban students decreased in grade 12 to the point that they were similar to rural students completing the course by distance education. (7) Crocker (2007) examined the differences in grades between students in distance education and classrooms. Crocker reported that, on average, across all courses, students in distance education courses perform slightly better than those in classroom courses; these differences though are small. (8) Access to distance education has improved for students and created opportunities for them. (9) The number of course offerings and enrolments had increased over time. The number of courses available to students has nearly doubled in the five-year period considered in the report. Likewise, the number of schools that relied upon distance education courses to enable students to fulfill part of their high school programme has risen. (10) First year university performance and persistence is significantly different between students who have previous experience with online education experiences and those who do not. (4) student motivation can be enhanced, for example, by easily accessed and convenient course support, an on-site teacher/mentor/facilitator with time dedicated to e-learning, interactive course delivery approaches, promoting a student learning culture, and the prior development of student essential skills and attributes needed for e-learning. Details of the research can be found in two reports: “Participation of high school students in the isolated communities of coastal Labrador in web-based learning, the current context, perspectives, successes, and challenges,” and “A Pan-Canadian survey of e-learning for Aboriginal high school students. (4) there was no evidence among fourth year university students that prior high school online learners were advantaged or superior to others or that their self-regulatory attributes such as time management and goal setting were different. Possible next steps in this research would be to examine (a) student transitions into the workforce and (b) the high school distance learners who selected non-university programs. Formally titled “District Leadership for the New Learning Environment,” this study sought to answer the question: How can district leaders use new and emerging technologies to facilitate better connections with trustees, district personnel, schools, and teachers? Drs. Jean Brown and Bruce Sheppard conducted individual and focus group interviews and administered surveys with provincial and national groups. In addition, Skuladottir (2011) made comparisons between administrators in the province of Newfoundland and Labrador and the country of Iceland. The theoretical framework of leadership that was used was collaborative, inclusive, values-based, goal-oriented, and focused on fostering organizational learning. Findings indicated that administrators were using new and emerging technology, but they were all too often not provided the professional development and technical support they needed. It was of interest to note that many district leaders saw the use of Smartphones on a 24/7 schedule as expected, although this was not supported by interviews with senior leaders. Trustees were interested in using new and emerging technology, but there was a wide range in the level of use—from those who blogged and used social networking as a means to communicate with parents, to others who were reluctant to even share private telephone numbers. Evidence supported the view that school districts were essential in assisting all school and district leaders in making better connections within the educational system. The objective of “Collaborative Learning Circles and Cybercells,” as part of the CURA study, was to link pre-service teacher education at Memorial University to selected schools in the province so that future students could take advantage of recent technological and organizational advances to link theory with practice. The link between pre-service and in-service teachers had developed using cybercells—a face-to-face group whose members extend their discussion to include virtual visitors (Stevens & Stewart, 2005). The study had three dimensions, all of which were met: (i) linking social and educational theory in intermediate and secondary courses at Memorial University to real life in classrooms in Newfoundland and Labrador schools; (ii) strengthening pre-service and in-service teacher links through discussion of shared issues; and (iii) providing insight into contemporary teacher education to practising teachers in schools in this province. Many graduating students from the teacher education program at Memorial University elected to continue to be associated with selected courses from their positions in schools to which they were appointed upon graduation. As professional associates of the faculty and located in schools, many provided practical insight into the day-to-day life of schools for pre-service teachers and in some cases facilitated links between theory and practice. This longitudinal study, conducted by Dr. Trudi Johnson, was a comparative analysis of the perceptions of distance education in the province of Newfoundland and Labrador over a ten-year period. Initial data was obtained from a study entitled “Effective Schooling in a TeleLearning Environment,” conducted by the Centre for TeleLearning and Rural Education, Faculty of Education, Memorial University in 1999–2000. Then in a series of extensive interviews throughout the province during 2009, principals, teachers, parents, and students were asked to comment on various aspects of distance education. Drawing on historical methodology, this research focused on the nature of change and continuity over time and attempted to explain why and how change occurs. The key findings are listed here. (1) In both studies, respondents consistently identified the lack of effective teacher-student interaction as a drawback of distance education. (2) In both studies, the majority of parents, teachers, administrators, and students believed that the distance education program is best suited for a particular type of student. Successful distance education students are more motivated and tend to work harder. There was a consensus among teachers, parents, and principals from both studies that being able to work with others is an important part of being successful in distance education courses. The majority of students in the recent study did not agree. (3) In the initial study, 92% of distance education students felt that taking distance education courses helped them to become more independent learners. The respondents in the 2009 study agreed on the benefits of distance education, which included the development of teamwork skills, communication skills, and self-confidence. (4) According to those who responded to the initial survey, offering distance courses to a few top students in a small school had a negative impact on the remainder of the school. This was an important concern in the early years of distance education. In contrast, very little was said of this issue in the more recent study. (5) In both studies, parents continued to feel strongly that distance education courses affected the government’s support for local schools and teachers and even challenged the existence of schools. In the 2009 study, there was a general feeling that community support for distance education had improved. (6) In the initial study, 95% of distance education students perceived that teachers had high expectations of them. This contrasts with 55% in the recent study. (7) In both studies, students consistently cited the physical presence of the teacher as the one major advantage of learning in a face-to-face classroom. Conducted by Dr. Elizabeth Murphy, this study was premised on Haughey’s (1997) argument that the teacher was the most essential element of successful secondary schools and that the e-teacher was therefore a pivotal factor in the effectiveness of distance education at the high school level. As in the face-to-face classroom, e-teaching practices must be guided by learner-centered principles that support engaging and meaningful opportunities to construct and share knowledge. Part of the research included a study conducted to gain insight into teachers’ beliefs about e-learning. Data collection relied on discussions conducted with sixteen teachers from six high schools in two adjacent municipalities of one Canadian province. Data collection and analysis were guided by a framework of research-validated, learner-centered principles. Teachers’ beliefs portrayed learners as digital natives who actively consume information and knowledge, engage emotionally with technology, and devote themselves to it. Beliefs about teaching referred to teachers as guides and mediators in the knowledge process who can give creative control of the technology, engage learners, and promote higher-order thinking skills. Beliefs about the Internet highlighted its potential to provide unlimited, authentic, purposeful, relevant, participatory, and individualized learning that can take place outside the classroom. In another part of the research, a framework was developed that might be used by researchers to analyse transcripts of discussions for evidence of engagement in metacognition, by instructors assessing learners’ participation in online discussions, or by designers setting up metacognitive experiences for learners. Specifically, prompts and examples were devised as a general guide or as a starting point for identifying and promoting metacognition in online discussions. Research conducted by the Killick Centre has resulted in numerous publications. Researchers and partners have co-presented at conferences worldwide, and four research projects have been honoured with international awards for excellence in research. In addition, the CURA-sponsored project has placed a major emphasis on student training, providing grants, fellowships, and employment opportunities to undergraduate and graduate students. In assessing the impact on community partners, ongoing dialogue has identified how the research can potentially influence policy and practice. As the project funding draws to an end, a final symposium will be held with partner organizations to review findings and to discuss the Killick Centre’s influence within the broader educational community. Crocker, R. (2007). Distance learning: access and outcomes. St. John’s, NL Memorial University of Newfoundland. Retrieved from http://www.mun.ca/killick/documents/TrendsReport_Draft2.pdf. Haughey, M. (1997). Successful secondary schools in Canada: A report on the exemplary schools project. Canadian Administrator, 36(5), 1–12. Seifert, T., & Sheppard, P. (2009). The effectiveness of web-based distance education courses in mathematics instruction: Briefing report 2009. St. John’s, NL: Memorial University of Newfoundland. Sheppard, P. (2009). Determining the effectiveness of web-based distance education in mitigating the rural-urban achievement gap. Unpublished master’s thesis. St. John’s, Newfoundland and Labrador, Canada: Memorial University of Newfoundland. Skuladottir, E. (2011). Principals’ use of technology in Iceland and Newfoundland and Labrador. Unpublished master’s thesis. St. John’s, Newfoundland and Labrador, Canada: Memorial University of Newfoundland. Stevens, K. J., & Stewart, D. (2005). Cybercells – Learning in actual and virtual groups. Melbourne, Australia: Thomson-Dunmore. Wicks, H. (2007). De-coding research language for the street. Gazette, 40(1), 4.